Nestled at the base of Mt. 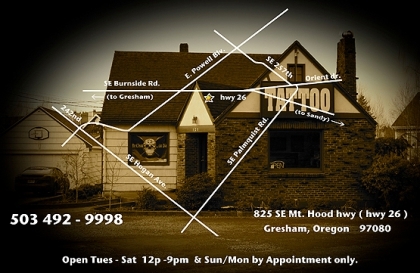 Hood in Gresham, Oregon is a fully custom Tattoo studio. We offer a unique fine art custom tattoo experience. The artist consults with each client for ideas and inspiration before the procedure. At this consult we do the basic sketching and layout as well as give a time and price estimate. Our method allows both the client and artist create an original image to enhance the body that will last a lifetime. We use modern, state of the art equipment and focused, informed technique to do the highest quality tattoo procedures. Our knowledge and application of clean tattoo procedure technique is unsurpassed in the industry. All of our state licensed artists have had superior training as well as continue to expand their education in the field. The artists of The House of Tattoo offer a clean, superb quality, custom tattoo art experience.